After attending the open house on the pond, here's what was discussed. The detention basin will be built and paid for by Pineview and Natural Resources Conservation Service (RCS). The recreations aspect of this project, if we decide to build it will be North Ogden City's responsibility to build out and maintain. WHAT'S BEEN SPENT SO FAR? According to the NO City summary document, we've combined with Pineview for $175,500 on planning and design—not sure yet on the split ratio. Another $274,500 came from NCRS (Natural Resources Conservation Service—which appears to be a subsidy of the USDA—also our tax dollars). Total thus far spent for planning and design is $450,000.00 [link]. WHAT WAS LEARNED AND WHAT WAS MISSING FROM THE OPEN HOUSE? How much will construction cost North Ogden City to if we build the recreational portion? $1,244,214.00 estimated [link]. How much will it cost to manage and maintain year in and year out? No hard info provided. Will we need additional insurance? No answers provided, only speculation. Our city insurance may or may not cover this feature. How will we control milfoil and algae problems? The basin, holding and recreation areas, will be drawn and used for irrigation on most days, with such a high turnover there shouldn't be such problems. What use will it be for recreation? No usage study has been done. How deep is the recreational portion of the basin? Roughly four feet at middle with a 10:1 slope. 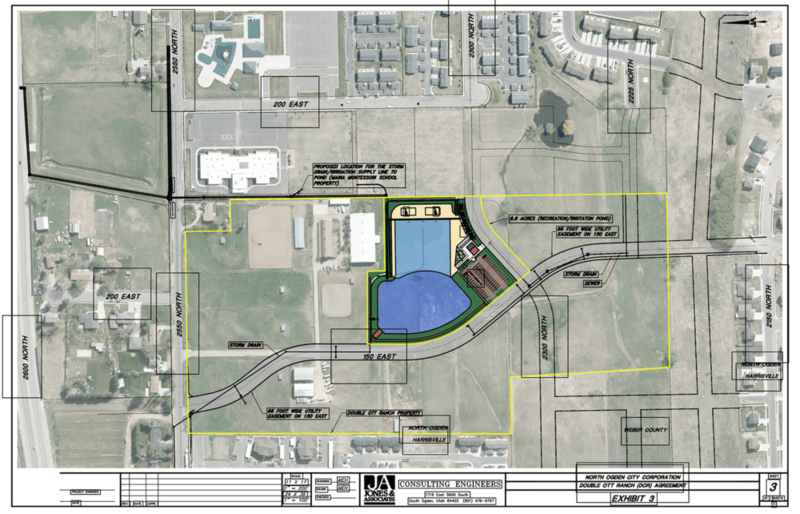 Will Pineview allow swimming on the retention portion of the pond? Not sure. Possibly, it will be under Pineview Water control. How does this compare and contrast to what Farr West City is building? Nothing provided. Will there be fishing? No, the water fluctuations and swimming nature of the design will not support or allow for fishing. How does this compare and contrast to Ogden City 21st Street Pond? Nothing provided. Is there any detailed cost breakdowns on the recreational aspect? No details were available. How will we deal with the safety issue the retention/recreation concrete dividing wall presents? Some brainstorming on this was done between the city engineer Matt Hartvigsen and Sean Casey. Tonight, well 4:00–6:00 PM, is the Pond Open House, marketed as the PROPOSED MULTI-USE DETENTION BASIN. With the agreement between the City and Double-Ott Ranch on the agenda for Council meeting tonight, how committed is the City to this project? How far into planning are we? Why are details and real information only being made public now? Please attend the Pond open house at City Hall and ask for the details: how much will this pond cost to manage and maintain year in and year out? Will we need to hire a beach and safety crew? Insurance? What use will it be for recreation? (I can see a NO-Town Regatta—with remote control boats....) Where can we find all the studies? Compare and contrast research must have been done. We have other city ponds nearby, Farr West is building something special right between OCA motocross park and Smith & Edwards. There's also the mountain of data from the 21st Street Pond in Ogden. How about detailed cost breakdowns? How about a liability and safety studies? The concrete wall in the middle, how far above or below waterline will that be? Fall off your paddle-board and hit your head on the concrete storage/recreational divider wall and it could be life changing, or ending. (NO City, expect mostly novice paddles to use this pond, and not many at that. But I'm sure there's a usage survey....) Neighbors, after you get some solid detail from our city leaders and planners, please let your voice be heard at the beginning of the City Council meeting immediately following the open house. If you don't you can count on it being built and you can count on spending real money on it year after year—just like our Aquatics Center and just like what we will be doing with the NO Amphitheater in Barker Park. June 2018 Links from Meeting Last Week. Minutes Not yet available.